Looking, feeling and performing your best takes more than eating right and studying hard. Exercise is one of the necessary ingredients in the formula for achieving the strength, stamina and attitude to be successful in your academic and social life. Your body is a unique combination of two sections - physical and mental. Excersise has many psychological as well as physical benefits. It can improve the quality of your by releasing the negative effects of built-up stress. It will help you relax and even sleep better, thereby improving your academic performance and concentration. In order to promote the proper way to a healthy body, we proudly introduce the health care device "Blood Circulatory Massager (BCM)". There is an old saying "Good circulation and breathing keeps a body healthy." Exercising is one way to maintain sound health. 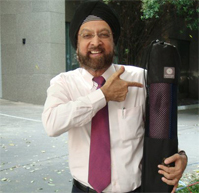 BCM is one of the most effective exercise device for restoring circulation of lymph and blood. Thousand of years ago, the Chinese discovered that energy circulates throughout the human body in chanels described as "meridians". The Chinese call these pathways meridians, but to the reflexologist they are known as "zones". Transverse zones divide the body into three sections. It is essential to your good health that the energy flow through these zones is maintained. Congestion can occur when waste products accumulate. For a good circulation and lymphatic system, one needs to breakdown this matter and clear the energy pathways. Acupressure, as the name suggests, is a system of alternative medicine that uses pressure to simulate this energy and remove blockages. Reflexology, too, is a similar form of treatment, but it concentrates on the feet and hands. Among the thousands of nerve endings on the sole of each foot and palm of each hand, there are "reflex areas" that communicate with all areas of your body and brain. All parts of our body are symmetrically represented in the palms and soles. These reflex areas become correspondingly sensitive with a disorder in the part of the body which they are related. Organs or parts on the right side of the body have their reflex areas on the right foot and right hand. Organs on the left side of the body have their reflex areas on the left foot and left hand. Organs extending past the middle or centre of the body will have reflex areas on both feet and hands. Massage and gentle pressure applied to these points simulates healing. Relexology is an essential holistic approach to healing. It aims to treat the whole person - mind, body and spirit. Blood is the life giving fluid that flows throught the human body. We cannot live without it. The heart pumps blood to all our body cells, supplying them with oxygen and food. At the same time blood carries carbon dioxide and other waste products from the cells. Blood also fights infections, keeps the temperature steady, and carries chemicals that regulate many body functions. Blood even has substances that plug broken blood vessels and so prevent us from bleeding to death. Peripheral vascular disease is the medical name given to a group of problems that causes poor circulation to the feet and legs. The most common cause of this is artherosclerosis ("hardening of the arteries") in which there is a gradual thickening and hardening of the walls of the arteries (the blood vessels that bring blood to the extremeties of the heart). Problems such as sores, infections, cuts, etc can develop that may not heal at all without special care. The reason for this is that the blood carries vital elements (e.g. oxygen) that the body's tissues need for vitality and healing. The high rate of vibrations generates a unique deep massage that reaches the pressure point. Massaging the pressure point stimulates the corresponding increase in blood flow to the related part of the body. The vibrations also have a twofold effect directly on the circulatory system. Firstly, the high speed vibration provides a direct & specific stimulus to the body which increases blood flow. Secondly, the spiral motion of the vibration pattern generates centrifugal forces that apply a flushing effect of the blood vessels. The blood then cleans and carries toxins and waste products out of the body. BCM promotes blood circulation to remove obstruction in the channels; ample supply of blood to the body parts ensures their evident functioning. Clock-wise circumrotation makes a rapid blood circulation within the body, increasin blood supply to the heart and brain, accelerating secretions and discharge, making the body healthy and clean. Increased blood, oxygen and lymph circulation will keep you free from illness. Massage has a remarkable relaxing effect, which tones the muscles and increases flexibiity, speeds up the natural healing process of the body, calms the mind and settles the emotions arising out of tensions. It is, therefore, considered as a perfect antitode to stress. Our blood circulatory machine also has a massaging effect. This enables the blood to distribute nutrients throughout the body and dispose of toxins. It also reduces lymph stagnation and enhances removal of wastes from the body. It stimulates the immune systems defense capacity, thereby, preventing disorders and diseases.